Hi, welcome to The Princesa Insolente Hostel, a surf house in Punta de Lobos surf spot. Walking distance to the beach and paddle in wave entrance. Great place, would definitely stay there again! I really love this place! My stay was for three days, and it had everything a good holiday should have: Nice breakfast, chill, surf, chill, good atmosphere and very nice personell, the ability taking part in a common dinner for a small extra money, a very nice bonfire and good music, and wonderful beds were you can sleep and dream very good. The kitchen facilities were really good and very clean. 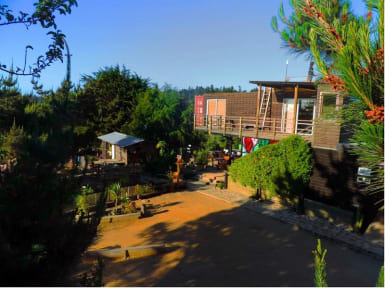 La Sirena Insolente Hostel in Pichilemu has also free space to practice exercices and a sauna. We love the Sirena insolente Hostel! It was one of the best hostels ever!! The atmosphere was great, friendly and helpful staff. The whole place is such amazing! Lots of space and a big outdoor area. Big rooms and the barthroom got cleaned every day. No lockers in our room, but you don’t need any! The beach is only 5 Minutes away. It takes half an hour to go to the centre, but you can take a collectivo for only 1000Pesos or walk along the beautiful beach. We are so sad that we have to leave.. This hostel is just awesome! So artistic, creative and full of positive vibes! Especially the staff there was so lovely, I had a great time there and would definitely recommend it to any person. Perfect stay. Great atmosphere. Felt like a trip with friends. We were so sad when we left! Super nahe am Spot. Schönes Hostel mit nettem Personal und super Atmosphäre zum anspannen und Surfen. The staff is great and gives the place really good vibes. Facilities could be better.